Anna and Louise could be sisters, but they don’t know each other. They are both married with children, and for the most part, they are happy. On almost the same day, Anna, a psychiatrist, crosses paths with Yves, a writer, while Louise, a lawyer, meets Anna’s analyst, Thomas. Love at first sight is still possible for those into their forties and long-married. But when you have already mapped out a life path, a passionate affair can come at a high price. For our four characters, their lives are unexpectedly turned upside down by the deliciously inconvenient arrival of love. For Anna, meeting Yves has brought a flurry of excitement to her life and made her question her values, her reliable husband, and her responsibilities to her children. For Louise, a successful career woman in a stable and comfortable marriage, her routine is uprooted by the youthful passion she feels for Thomas. 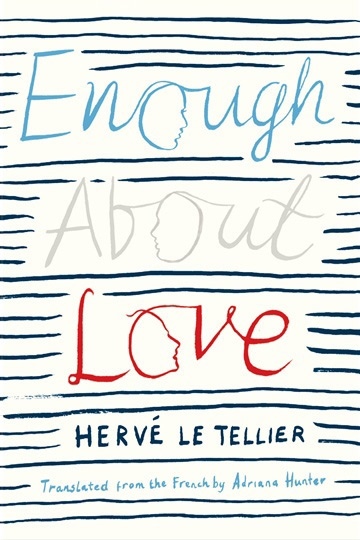 Thought-provoking, sophisticated, and, above all, amusing, this novel from Oulipo writer Herve Le Tellier captures the euphoria of desire through tender and unflinching portraits of husbands, wives, and lovers. Hervé Le Tellier is a writer, journalist, mathematician, food critic, and teacher. He has been a member of the Oulipo group since 1992 and one of the “papous” of the famous France Culture radio show. He has published fifteen books of stories, essays, and novels, including Enough About Love, Electrico W, and The Sextine Chapel.